Geese swimming in water and walking on a dock in a marina. Geese can be challenging guests to evict, but a variety of techniques can help you take back your dock. While every flock is different -- and you must tailor your approach to your specific situation -- trained dogs, decoys, habitat modification, exclusionary measures and commercial deterrents often discourage loitering geese. A “shotgun” approach that relies on several different tactics often produces the best results. Anything that frightens geese can be an effective deterrent. Some good deterrents -- such as swan decoys, specially trained herding dogs and artificial raptors -- serve as physical threats and frighten geese for obvious reasons. On the other hand, many people have found that Mylar tape, colorful balloons and other harmless deterrents work well. Still other deterrents work more generally, by producing loud sounds, flashing lights and similar stimuli. Try to employ more than one type of deterrent to get the best results, and be sure to move predatory decoys frequently to avoid acclimatizing the geese to the plastic predators. 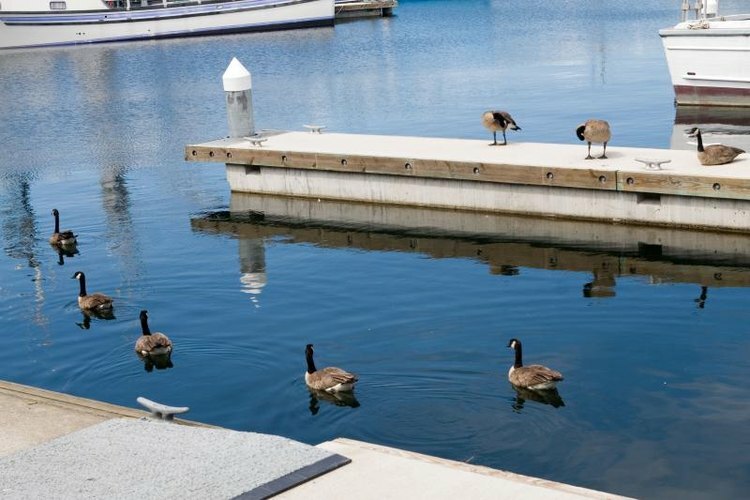 If deterrents fail to work, you can install structures that prevent geese from accessing the dock at all. Energized fences and plastic mesh fences work well, but they restrict your access to the dock. Altering the area around your dock can also prevent geese from walking out onto the wood. Geese avoid areas of dense vegetation and reduced sightlines -- especially when they occur near the water-land interface. Plant hedges and native grasses near the shore and design undulating, rather than straight, paths leading from the dock to the water.